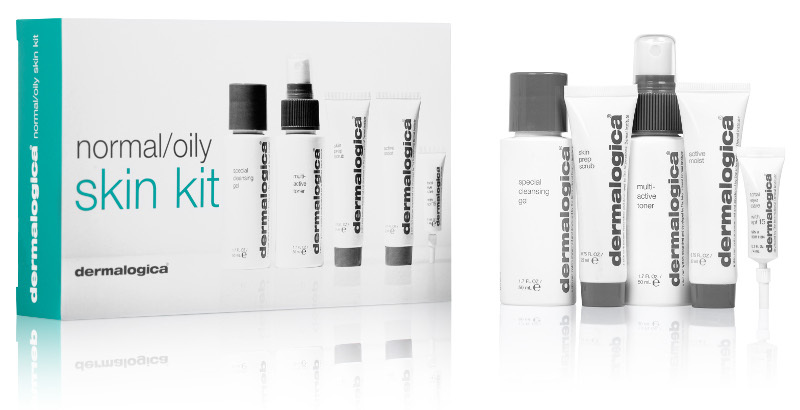 Dermalogica Normal/Oily Skin Kit (5 Piece) Benefits Soothing skin care kit for normal to oily skin conditions Contains a full regimen of all the products needed to treat skin Great to just try out the products before buying retail sizes Perfect for travel or to slip into a carry-on bag! Features Dermalogica Special Cleansing Gel (1.7 oz), Dermalogica Multi-Active Toner (1.7 oz), Dermalogica Skin Prep Scrub (0.75 oz), Dermalogica Active Moist (0.75 oz), Dermalogica Climate Control Lip Treatment (0.15 oz) Best for those with normal to oily skin, Dermalogica’s Normal/Oily Skin Kit contains 5 essential products needed to treat skin perfectly. This kit is great as a started kit or perfect for those that are always on the go and need travel sizes.